I am so excited to announce my latest project! 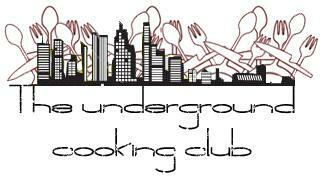 I would like to present to you all… drum roll please… THE UNDERGROUND COOKING CLUB! What’s all the fuss about you might ask; well allow me to explain. The underground cooking club hosts events where individuals can learn new recipes and eat the dishes they make while enjoying the company of others. So in other words if you want to do something other than go to a movie or visit the local bar on a Friday night, this is a new nightlife option. If you are going out for a date, want to surprise him/her with something different, again, great choice. If you are bored of your usual social circle and want to meet new people, this is the place. If you want to just spend time with your awesome friends, this also works. The underground cooking club is great for anything, everything and everyone. From business people, foodies and groups of friends to couples, loners or future chefs… I have put this together for all of you…Yes, you! Basically you check out the weekly menu options, choose one you like, sign up and show up. You learn to make a full 5 course meal with the help of a professional chef and then you sit down and eat it with your fellow cooks. You even get to take all the recipes home with you, so you can make them again. All you have to bring is yourself and your beverage of choice…everything else is taken care of! I would like to extend a thank you slash shout out to Okra Catering Service who will be hosting the club. By popular demand the premiere menu will be an Italian feast!